So that's Brighter in the Dark in a nutshell but here's some more context. 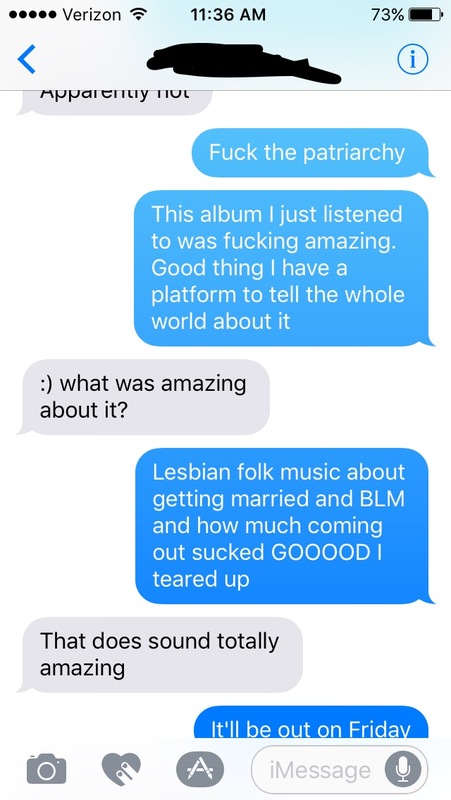 Mouths of Babes is a queer folk supergroup (super-duo?) comprised of Ingrid Elizabeth of Coyote Grace and Ty Greenstein of Girlyman (still kicking myself for not seeing them in Philly right before they "went on hiatus".) The pair met when they toured together under their former projects. As the songs on the album tell it, their courtship sounds like a fairytale, and this album features the songs produced since their marriage. Mouths of Babes could never have predicted, of course, how necessary this album is in a post-Tr*mp world. As I listened to the album, I appreciated the songs about love and courtship, the way sometime things just fall into place, opening oneself up to vulnerability, how great it is to be in love...you know, all that good stuff. I appreciated finding some jewels of joy in the mire of anxiety and anger and helplessness I've been feeling lately. I wondered, though, how I was going to write about something so simple and happy. It wasn't until rather late in the album -- at "Any Other Day" that things snapped into place for me. It's a song that is quiet and powerful, a song that sears through any critiques anyone might have of Black Lives Matter, a jolt of action for anyone who thinks it's not their place to get involved, or that attending the Women's March is enough activism for four years. The immediate follow-up by "Red Balloon" (at least in my version of the album) is what got me. The song describes feeling awkward and out of place growing up queer and knowing that you're somehow, painfully different than all the other girls. It also addresses that sense of tiny jealousy and admiration I've felt myself when you're with a partner who never had much of a struggle coming to terms with their identity. It's a hopeful song, though, reminding us that the pain is worth it when you find someone to call home. The album title is fitting for us. 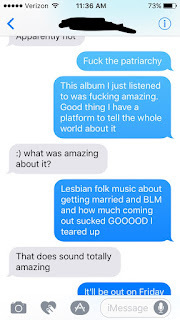 We need music that documents queer love, that shows people struggling against social expectations, that reminds us that we all have the resilience we need to make it through, and that it's important to draw that resilience from others.